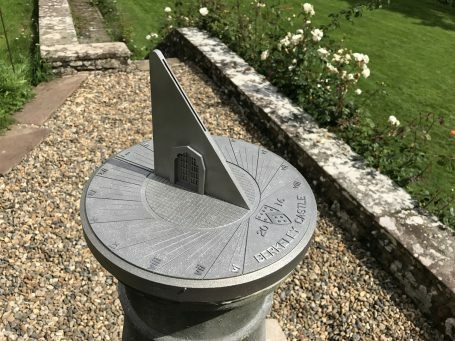 Global engineering technologies company, Renishaw, has worked with the Friends of Berkeley Castle to create an additively manufactured sun dial for historic Berkeley Castle in Gloucestershire, UK. Because sun dials are specific to one latitude and longitude, a bespoke product was essential for the project to be successful. Renishaw used its own additive manufacturing technology to produce a precise final product. The finished sun dial was unveiled at the Friends’ Summer Party in August 2017 and will be displayed in the Castle’s garden on a pedestal. The Friends of Berkeley Castle approached Renishaw about creating a unique sun dial design for the 12th century castle. Retired mechanical engineer and Friends of Berkeley Castle Member, Bob Hunt, designed the sun dial according to the castle’s latitude and longitude. The design incorporated specific features to link the sun dial to Berkeley Castle, including the Berkeley Arch and Door in the design of the gnomon (vertical piece) and a moat and cobbled courtyard on the dial face (horizontal piece). By careful design, the sun dial provides additional information, for example by projecting a beam of light onto the dial face at midday. This beam of light can be used to indicate the Vernal and Autumnal equinox. Another feature achieved by precision engineering and careful design, is that the shadow cast by the extended arch will align with the light beam only at midday on the equinox. Construction of the sun dial required high precision, which was achieved using metal additive manufacturing. The design was manufactured on a Renishaw AM250 metal additive manufacturing system from stainless steel. Once completed, the sun dial was mounted on to the empty pedestal using a specially designed mounting unit, ensuring correct alignment with the sun. Members of the Friends of Berkeley Castle assist the Berkeley Castle Charitable Trust, which is dedicated to the preservation, conservation and restoration of Berkeley Castle, its contents and its gardens.